Camarillo, CA – Heart fans are ecstatic with the release of the band’s evocative and controversial second album ‘Magazine’ on Hybrid SACD by Marshall Blonstein’s Audio Fidelity! ‘Magazine’ shows Heart while they were still an idealistically young band, before they became such a worldwide phenomenon. Their second album shows the same impassioned songs that marked the band’s debut, ‘Dreamboat Annie’. They were really hard rockers back then. Ann and Nancy Wilson wove a tapestry of gypsy meets modern woman, and it is highly involved in the early songwriting. The album features a mix of ballads and straight out rock-blues-metal at its purest. 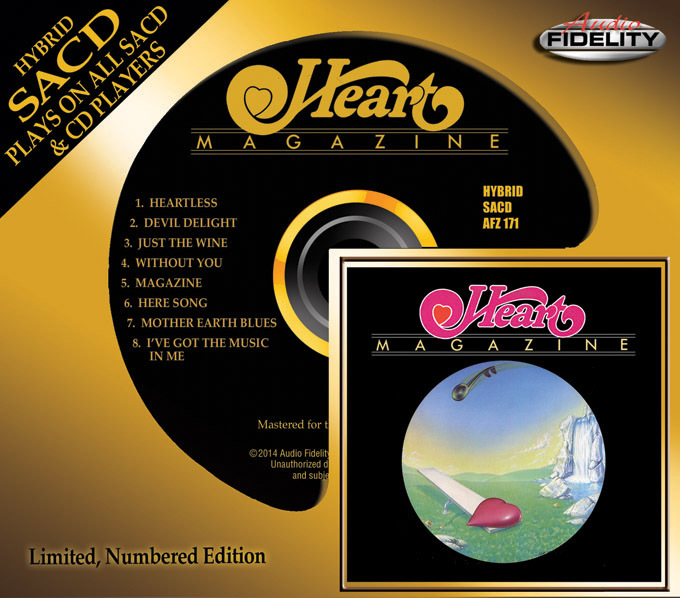 Heart’s ‘Magazine’ eventually went platinum and peaked at #17 on the album charts, and the album’s only single “Heartless” landed in the Top 40.